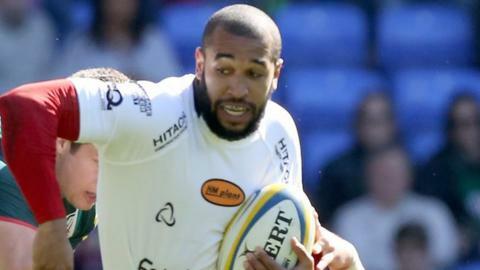 Wasps overcame a dreadful start to virtually guarantee a place in the European Champions Cup play-offs with victory over Newcastle at Adams Park. In a seesaw 11-try thriller, Newcastle secured their Premiership safety with a bonus-point defeat on a day when rivals Worcester's fate was finally sealed with a heavy defeat at Saracens. After trailing 17-0 after 13 minutes, the hosts scored 29 unanswered points. Newcastle rallied to regain the lead at 31-29 before Wasps regrouped late on. The home side scored six tries, Nathan Hughes (2), Ashley Johnson, Will Helu, Charlie Hayter and Joe Simpson all crossing, while Worcester old boy Andy Goode kicked four conversions and two penalties for a 14-point individual haul. Hughes had a very impressive first half but was withdrawn at half-time, although his injury is not viewed as serious. Newcastle scored early tries through Mike Blair and Joel Hodgson, who converted both, either side of kicking a penalty, as an upset looked on the cards. The Falcons were then subjected to a four-try blitz from Wasps but recovered to score three second-half tries from Noah Cato (2) and George McGuigan, all converted by Hodgson, who contributed 13 of their season-best 38-point haul. "We would have settled for a bonus-point win but we were very patchy. There will be two very concerned defence coaches after this. They won the first and third quarters, we won the third and last. "It is very frustrating. In a lot of games this season we have given the big sides a head start and that gives us a mountain to climb. Again, in the second half, some of our inaccuracies allowed them to get back into the game. "Nathan Hughes had a nasty bang on the shin and cramp was affecting his calf. I would rather take off a player sooner rather than later." "Staying up with a week to go is a job well done. I am frustrated that there were not more wins but this gives us an opportunity to better prepare for next season. Last year we didn't know that we were up until May 29 - so it was always going to be difficult. "We went 17 points up pretty easily but their back five, which would grace any international XV, increased their intensity to cause us big problems. "There was some outstanding play from both sides and our half-backs, Joel Hodgson and Mike Blair, were exceptional." Wasps: Masi; Helu, Daly, Hayter, Varndell; Goode, Simpson, Mullan, Festuccia, Swainston, Launchbury, Palmer, Johnson, Haskell, Hughes, Jones. Replacements: Jones for Hughes (41), Cannon for Jones (43), McIntyre for Festuccia (53), Davies for Simpson (61), Carlisle for Goode (71), Vea for Launchbury (71), T Bell for Masi (72). Sin Bin: Hayter (80), Haskell (80). Newcastle: Tait; Cato, Tiesi, Fitzpatrick, Sinoti; Hodgson, Blair; Vickers, Lawson, Brookes, MacLeod, Barrow, Mayhew, Welch, M Wilson, McGuigan. Replacements: Tomaszczyk for Lawson (41), McGuigan for Brookes (41), Smith for Tiesi (65), Saull for Mayhew (65), S. Wilson for McGuigan (65), Spencer for Fitzpatrick (71), Fury for Barrow (71).